The Kensington Market Research Project (KMRP) aims to produce an unprecedented body of rich and detailed knowledge about Toronto’s most celebrated multicultural heritage district. Bordered by China Town and adjacent to the University of Toronto’s downtown campus, Kensington Market boasts the city’s best known enclave of social diversity and counter-culture nestled in a backdrop of Victorian-era row-houses converted to street-level shops. 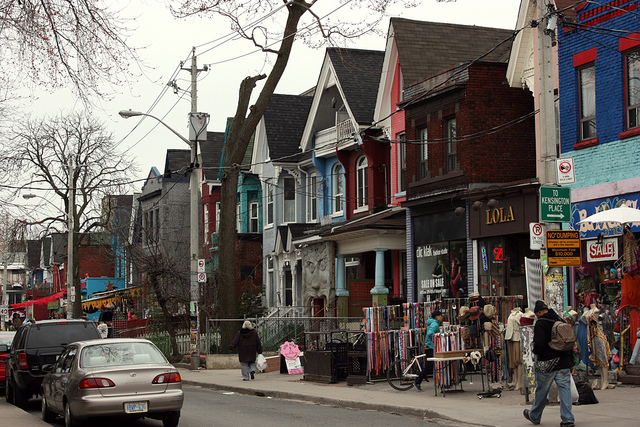 Designated as a National Historic Site of Canada in 2006 for its colorful history of transformation from a 19th century immigrant refuge, to a Jewish market neighborhood, to its current vibrant tapestry of independently owned shops and residences, Kensington Market is strongly valued both locally and nationally. This project, the first of its kind, uses ethnography to study in-depth the market in an age of large-scale urban transformation. As downtown Toronto faces the encroachment of big corporate retailers, the impending conversion of public housing into private condominiums, and the expansion of Toronto Western Hospital, the Kensington Market Research Project strives to document the inevitable changes to the market. Over the course of years to come, the project will provide a publicly accessible archive of rich and detailed data to be used in evidence-based policy decision making, and to make visible the social complexity of this unique Toronto site.